is a communications expert, author, speaker and sought after leadership coach. In her 25-year career working with leaders to help them communicate more effectively she’s encountered every personality type imaginable, yet remains more than a little passionate that anyone can learn presence. Through her coaching and workshops, she’s worked with CEOs, senior leaders and professionals in companies spanning the Fortune 500, non-profits and the U.S. government. In addition to running The Hedges Company, she is a founding partner in the leadership development firm, Element North. 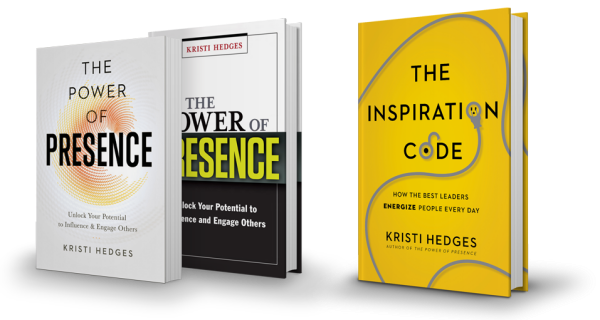 Kristi writes about leadership for Forbes and Harvard Business Review and is regularly featured in publications such as The Wall Street Journal, The Financial Times, Entrepreneur, BBC, Chief Learning Officer and CNBC. She’s been honored as one of the “50 Women Who Mean Business in Washington, D.C.” and as an owner of a top 25 Largest Women-Owned Businesses by the Washington Business Journal. Prior to becoming a leadership coach, Kristi co-founded and ran one of the first technology communications firms in the Washington, D.C. area for a decade before successfully selling her interest. Her career highlights also include working for a national news outlet, and as a political consultant for dozens of electoral campaigns from U.S. President to statewide offices. Kristi holds a Phi Beta Kappa B.A. from Virginia Tech and an M.S. from Purdue University. She is an ICF-credentialed leadership coach through Georgetown University, and is a teaching faculty member in Georgetown’s Institute for Transformational Leadership. Interested in leadership coaching, workshops or keynote speaking?